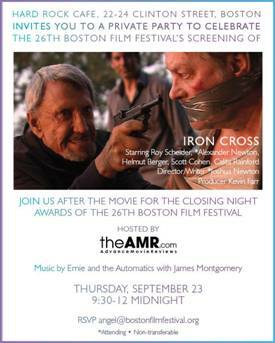 You and a guest are invited to attend the Boston Film Festival Closing Night sneak preview of the motion picture thriller “Iron Cross” staring Roy Scheider. You and your guest can also attend the after party which will be at Hard Rock Cafe immediately following the screening. Please present your BU ID at the entrance to the Stuart Street Playhouse to obtain your screening and after party tickets. This special screening is at 7:00pm this Thursday, September 23rd. Check out their website, Facebook and Twitter!